There is great pride in knowing that our community has remained strong from the beginning, and amidst the early development of our community, Eureka Cemetery has proudly housed the loved ones' past. We are proud to hold the evolution of our history in physical form. We are a 501(c)(13) organization and require the generosity of donors in our community and around the world to keep our history alive. 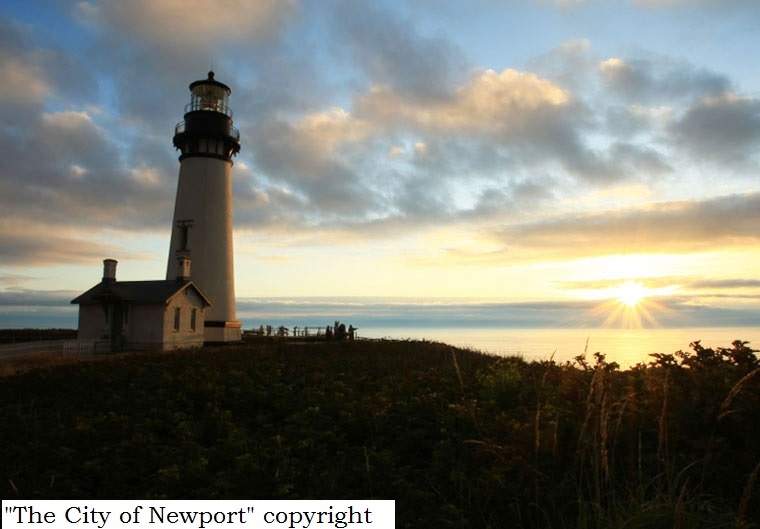 Newport's history is strong, proud, and pioneering. We have a history of standing together through the best and the worst of times. We are a profound community with a history we strive to preserve and record for generations to come. If you would like to support our organization please donate today! Beautifully preserved historical photographs, we wanted to share. The first burial at what is now known at Eureka Cemetery & Mausoleum occurred in 1879, three years before Newport was incorporated as a city. 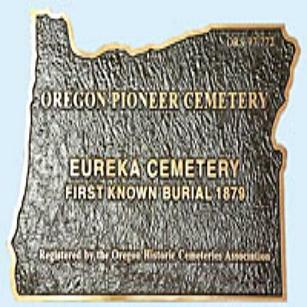 Incorporated on January 18, 1889, Eureka Cemetery was the first incorporated cemetery in Lincoln County. 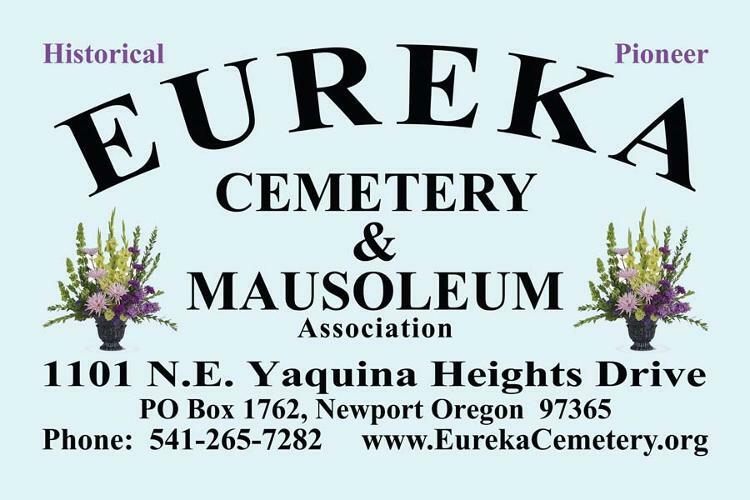 Today Eureka Cemetery & Mausoleum covers 22 acres plus a mausoleum. The Cemetery is open to the public. Visitors may enjoy the rolling hills,beautiful views, stone picnic tables,benches and a massive 102 year old California Spruce tree. Visitors seeking to know the history can appreciate our unique and fascinating glimpse into our area's past. The cemetery is a final resting place for many of the pioneers and founders of the city of Newport. We are located 1/4 mile up NE Yaquina Heights drive, past Bateman Funeral Home. 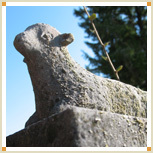 Eureka Cemetery and Mausoleum is dedicated to preserving the rich history of the Oregon Coast. To learn more or to donate to the preservation of our past for generations still to come please feel free to contact us. Donations are made simple through this website, which is also funded and maintained only with the generosity of donations. John Nye was one of the original founders of Newport and in 1866 he obtained a 160 acre land claim when Newport was first opened for settlement. The land the Nye's claimed is now known as the Historic Nye Beach District and the beautiful Nye Beach. Nye traveled to Indiana to marry Olive Kist, a native of Ohio. 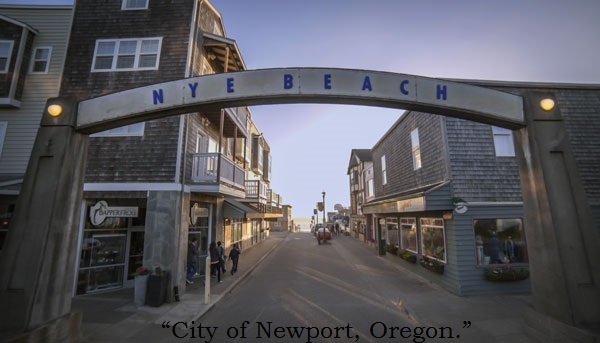 When Nye plated Nye Beach, he renamed Olive street for his wife. Together John and Olive raised eight children. The Historic Nye Beach today. Monta Maley was a Civil War nurse who was awarded the American flag for her service. The flag to Monta Maley was gifted to her personally by President Abraham Lincoln. After special permission was granted from the U.S. government the flag was buried with her at the Eureka Cemetery. Samuel Case took up a claim in 1866 when native American lands were opened up for homesteading. The land he claimed is now a part of the city of Newport. In 1868 Samuel Case married Mary. Mary Craigie was the daughter of James Craigie, another pioneer and prominent settler, and her mother was an Indian Princess. Together they had six children. Samuel was Newport's first school teacher and donated a parcel of land for Newport's first school. Dr. James Bayley and Samuel Case finished the Ocean House, a hotel where the Coast Guard Station now stands. In 1873 he along with Bayley, laid out the plans for the City of Newport. Samuel Case also served as a Trustee with the Eureka Cemetery Association. Many of the older headstones and markers offer a glimpse of the highly skilled craftsmanship and unique symbolism employed to deliver loved ones to the beyond.